April 11-14, 2018 in Atlanta, GA will be the 5th annual PELICE/Wood Bionenergy Conference & Expo consecutively promoting the sustainability in wood products. Industry professionals from the industrial wood pellet, heating wood pellet, biomass power, biofuels and in-woods chipping sectors come together to share information and network. We hope you’ll stop by BOOTH C402S to see our sensors performing live demonstrations throughout the show! Moisture measurement and control is a crucial aspect of the forest product and pellet manufacturing process. MoistTech manufactures both on line and lab moisture analyzers. Our online IR3000 series is ideal for process control of dryers, blenders and incoming raw material providing real time accuracy moisture measurement. 100% of their product quality, instantly and consistently. Measuring moisture throughout the wood pelletizing process will produce pellets at a specific moisture percentage preventing the out of specification when the product is too wet or too dry. Additionally, pro-active adjustments can be made to the process, to optimize pellet manufacturing. Can’t utilize an -online solution or have other goals in mind? We also offer a laboratory unit as well to meet all of our customers needs. 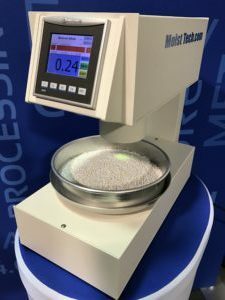 MoistTech’s new model 868 Biomass lab moisture analyzer provides the user with high accurate moisture results within seconds on ranges of moisture between 0.0 % – 80 % percent. Customers using MoistTech moisture instrumentation can improve product quality and reduce fuel usage by preventing excess drying together with a reduction of fire risk in many installations. Contact Us for more information on Wood Product Applications OR to discuss a specific application you work with.